Helsinki-headquartered food order and delivery service Wolt Enterprises Oy announced its entrance to Israel in late 2018, when it decided to expand beyond the Scandinavian countries and Eastern Europe. Yandex NV, the Russian multinational technology company, chose the greater Tel Aviv area as its first target market outside former Soviet Union states for its taxi-hailing service Yango. It also picked Israel as one of the first markets for its music streaming service. E-cigarette maker Juul Labs Inc. hit Israeli shelves in May 2018, in the company’s first venture outside of the U.S.
Juul’s decision to operate in Israel had to do with the country’s regulatory “open-mindedness,” a company spokesperson told Calcalist in August. Soon enough Juul found out the Israeli regulator can at times spring into quick action. In September, an edict by the country’s Ministry of Health forced the company to remove high-concentration nicotine pods from local shelves. Other companies that launched local services or announced their intention to do so include bike-sharing company Beijing Mobike Technology Co. Ltd., Chinese bike-sharing company Ofo, and California-headquartered smart-mobility company Lime. Mobike started offering limited services outside of Tel Aviv in March 2018. 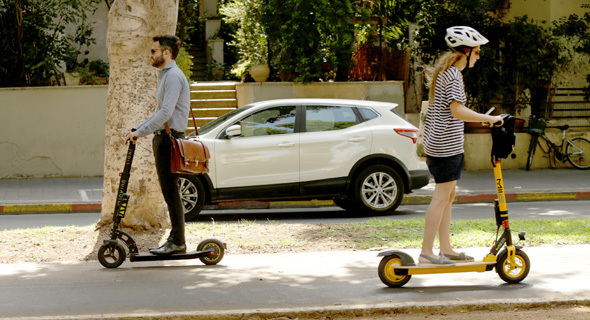 Ofo, which launched a pilot in April 2018 in Ramat Gan, east of Tel Aviv, withdrew from the country by the end of July. An ecosystem takes time to mature but once it is there, things start happening on their own, Studener said. One added factor: the quick-to-develop Israeli market is getting bigger. Some of the newcomers to the market, like food delivery services and mobility services, specifically address the needs of Tel Aviv’s growing cadre of affluent tech employees. Market size and a relative lack of competition drew Yandex to launch a taxi service here, Aram Sargsyan, regional general manager of EMEA and the Russian commonwealth at Yandex Taxi said in an interview with Calcalist in December. Yandex also has other local operations, and the company’s Jewish founder and CEO Arkadi Volozh often visits Israel. In a September interview with Calcalist, Kostya Kilimnik, the head of Y-Data, a one-year AI training program offered by Yandex in Israel, said the country is a good fit for the company’s music streaming service as it has a large Russian-speaking population. In 2015 Israel had around 750,000 residents who were born in the former Soviet Union, according to Israel's Central Bureau of Statistics. Many second-generation Israelis of Russian origin also speak the language. An aspiring global city, dotted by tech startups, Tel Aviv opens its arms to new ventures, Sargsyan said. Investment trends also play a part. Bigger funding rounds and a winner-takes-it-all mindset means more companies are seeking to expand beyond their home turf quicker. Bird started considering Tel Aviv as a potential market only seven months after it was founded, Studener said.